Natural Society has been talking about the dangers of Aspartame for quite some time now. It is a dangerous artificial sweetener found in many of the foods we consume every day, including soft drinks, chewing gum, breakfast cereals, and jams. Now, it’s important to know that aspartame may be disguised as a new name in your favorite foods – aminosweet. Used as a sugar substitute and often marketed as Nutrasweet and Equal, aspartame is an excitotoxin that destroys the brain and body. Its use has been a controversial subject since the 1980s when the CEO of Searle, Donald Rumsfeld, pushed for it’s approval to be sold on the market. Now, its name is being changed, with FDA approval, to try to dupe millions into purchasing and consuming this toxin once again. Aspartame, even renamed Amino Sweet, is not safe. This substance is made using genetically modified bacteria in the US, but according to a Monsanto source, the UK market does not have to eat genetically modified bacteria excrement. 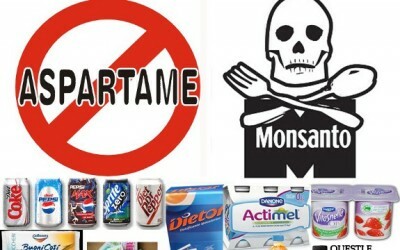 Many ‘low-calorie’ foods contain GMO aspartame, however, even overseas. Aspartame may cause blindness, cancer, and brain tumors. Just as a reminder of who is pushing this excrement – quite literally – on the consumers of the United states, it was Mr. Rumsfeld who went on to become George W. Bush’s secretary of Defense, and crony-Capitalist agenda-pusher. This one substance has continually been shown to cause harm to human health, so why is the FDA renaming it instead of banning it completely from the food supply? There is considerable evidence that artificial sweeteners cause cancer, including aspartame specifically – so why not name it something more appropriate at least? ‘Sickeningly Sweet’ might be more appropriate. The problem, and what more research concluded, is that aspartame breaks down into something called Phenylalanine, among other things. This can cause a disorder known as Phenylketonuria. Not only that, but aspartame is also chemically addictive to the body, even though it damages it profoundly – just like other drugs. This is why food makers want to put it in their products – so you will buy more of them. Aspartame, or Amino Sweet – its all the same toxic substance. Watch out for it on food labels. Eat honey, apple sauce, raw, non-GMO sugar, and other REAL food sweeteners instead. You deserve to live a sweet life without being a sucker. Double recessive genes cause Phenylketonuria, not aspartame. Aspartame is bad stuff, but please stop reinventing “science.” PKU is a genetics disorder. Please research. Thanks – from a mom of a PKUer, who didn’t drink aspartame while pregnant. I don’t know if aspartame can cause cancer. What I DO know is that I, personally, am very sensitive to aspartame. It can give me awful headaches and plays havoc with my attention span. When I’ve been consuming aspartame I find it very difficult to maintain focus on anything, my head feels funny and I can’t work. Whether or not it’s ‘approved’ doesn’t really tell you anything beyond the limited parameters of the trials upon which that approval is based. Asbestos was an ‘approved’ building material for many years but that doesn’t mean it wasn’t causing asbestos-related diseases in thousands of people before its use was banned. Approved in over 90 countries. Read the wikipedia article. Its fine you are making most of this stuff up. Most will rant about this but drink alcohol with no problem. Ethanol is used to sterilize surgical instruments, but we drink and survive. OMG I’ve been using this for over 15 years and I’m still here. Suger is the killer. My dry-eye syndrome went away two months after eliminating all sources of Aspartame. It wasn’t easy. It was in my chewing gum, cereal and yogurt. I now read every label and refuse to buy anything with Aspartame or preservatives or added sugar in it. I now weigh the same I did when I was younger and feel like a new person. Remember way back, about 10 years ago when you people were making this claim? Go check. It’s still aspartame. OMG U GUISE! WORLD END AT CORNER OF FLAT EARTHRRAAAAAGGHHGHH!!!! Christina: Thanks for a timely warning on the dangers of the Aspartame product. I would ask however that you research a little more comprehensively before you post information on the web. Aspartame does not have the ability to cause Phenylketonuria, it is simply a product which is especially dangerous in the diet of a PKU sufferer. PKU is a genetic disorder inherited from the parents of the sufferer. Aspertame avoidance is simply a part of the dietery control of this condition. One out of every four complaints to the FDA is about Aspartame. So I say politely to the FDA, “For Shame, for you know better.” “Your job is to protect the American people, first and foremost”. How about calling it, “Dementia or Alzheimer’s Sweet”? Since as an excitotoxin, it is also a neurotoxin!